One of the things most of us really dislike when browsing different sites is the autoplay videos. Not only the video streaming consumes a lot of data but the sudden or unexpected audio can be pretty obnoxious. This is very prevalent in major new websites that stream their own news, which is often irrelevant to the news you are reading. 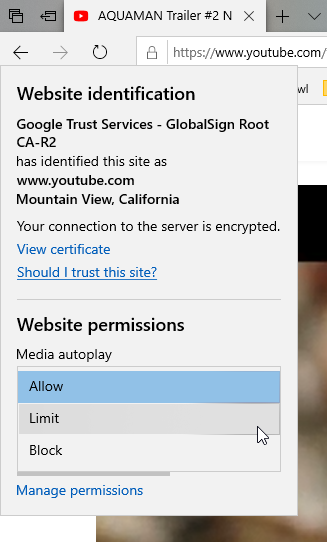 To deal with the issue, Microsoft finally made it easy to block autoplay videos in the Edge browser with the October 2018 update. The good thing is, you can block autoplay videos globally or on a per-site basis. Here's how to disable video autoplay in the Edge browser. You can block autoplay videos in Edge globally by modifying the advanced settings in the browser. When you disable video autoplay in Edge, no video will autoplay in any Edge tab. Click on the "Menu" icon (three dots) appearing at the top-right corner. On the right panel, select one of the below options. Allow: This is the default setting and it allows any site to autoplay videos. Limit: Blocks autoplay for muted videos but starts autoplay when you click anywhere on the website. Block: Completely blocks video autoplay on all websites. That is all. You've successfully disabled autoplay videos globally in Edge browser. If you don't want to disable video autoplay globally, you can block it on a per-site basis. This is very helpful when you want to block autoplay media on any offending website. Go to the website you want to block video autoplay. Click on the Lock or Globe icon in the address bar. In the website permissions menu, click on the link "Media autoplay settings". Now select one of the following options. Allow: This is the default settings and it allows any site to autoplay videos. That's it. You've blocks autoplay videos for that particular website. There are two ways to allow autoplay on any website in Edge. Follow the one that is most suitable for you. Now, select "Allow" from the drop-down menu. Now, click on the "Manage permissions" button under Website Permissions section. Find the website you want to unblock and click on the "X" icon next to it. That is it. You've unblocked video autoplay. 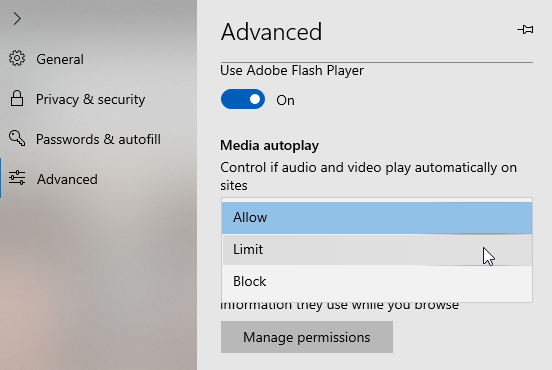 It is that simple to disable autoplay videos in Edge browser in Windows 10.